Yesterday in Amsterdam, the World Press Photo judges announced the winners of their annual contest. 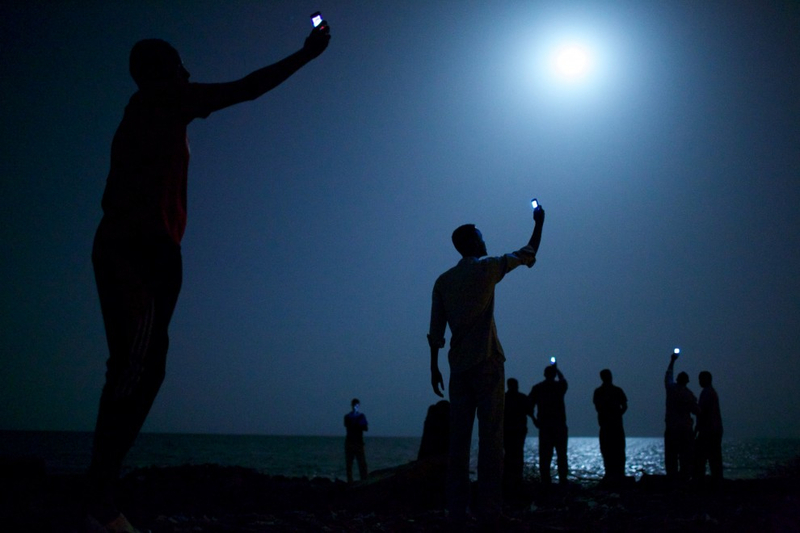 A picture of moonlit African migrants standing on the shore of Djibouti City, their phones held high to catch a cheap signal from Somalia across the border, won the World Press Photo of the Year for American photographer John Stanmeyer. The silhouetted figures facing seawards are straining to pick up a cheaper mobile signal to establish a tenuous link with relatives abroad. Djibouti is a common stop-off point for migrants heading from nearby countries like Somalia, Ethiopia and Eritrea in search of a better life in Europe and the Middle East. This photo is one of my favourites taken in 2013 and I let out a cheer when it was announced as the winner — it is magnificent. By John Stanmeyer VII Agency for National Geographic. Some of the above details with credit to Reuters.